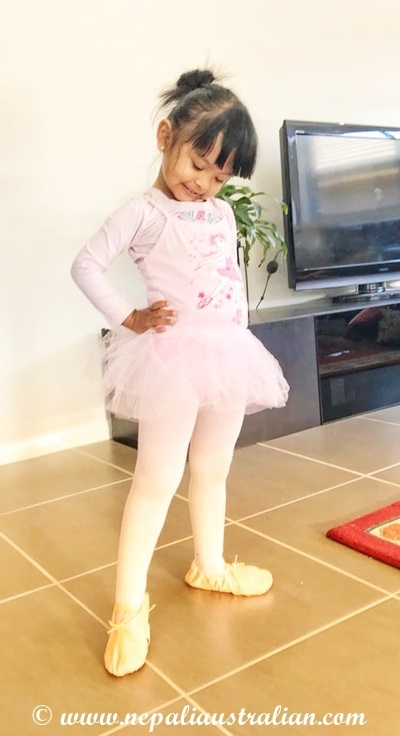 We have enrolled Chhori into Ballet class and she is over the moon. 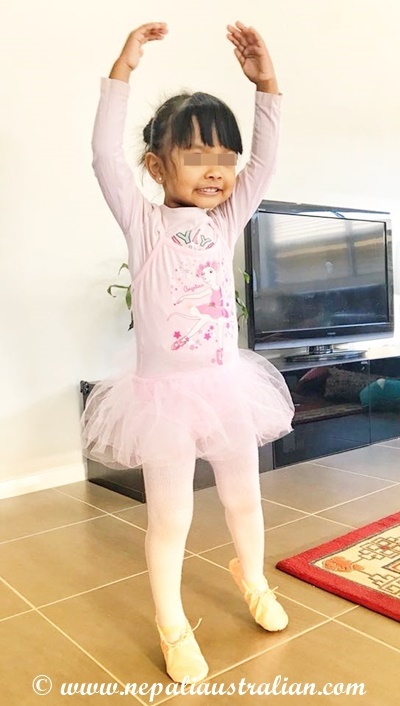 She is a big fan of Emma wiggle and Angelina ballerina so when we bought her the ballet costume and shoes, she was so happy that she was dancing all day. I know I am biased but she looks super cute in her Ballerina outfit. Finally after so many ups and down, the wedding rituals began. 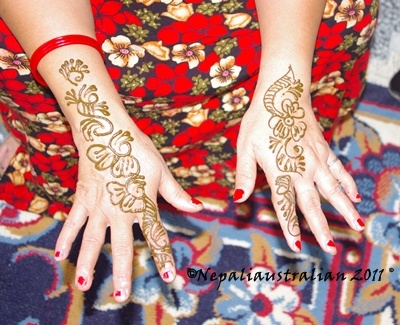 The first ritual was the Mehendi ceremony. 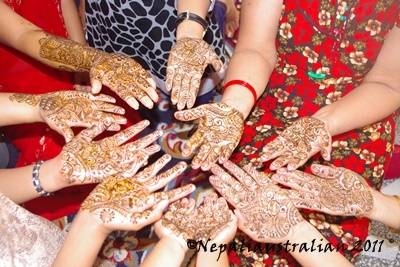 Mehendi ceremony is not a traditional part in Nepali wedding but I wanted to do something similar to hen’s night in Nepal. 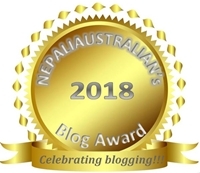 I did have a hen’s night in Australia but I still wanted to do something in Nepal with my cousins and friends as well to remember my wedding as a fun ceremony. 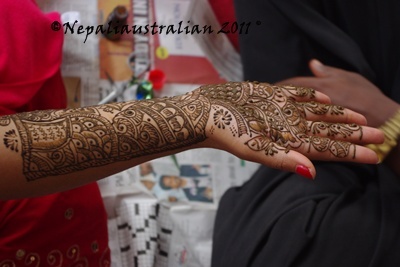 Mehendi means henna and, during this ceremony, a henna artist applies mehendi to the bride’s hands and feet, as well as to the hands of all female relatives and friends. This is purely done for decoration and to make the bride look even more beautiful on her wedding day. So I arranged a person to come to my place to put Mehendi on. I invited all my close female relatives and good friends. So it was going to be a girl’s night with Mehendi and music. I went for bridal Mehendi while all my friends and family had simpler ones. 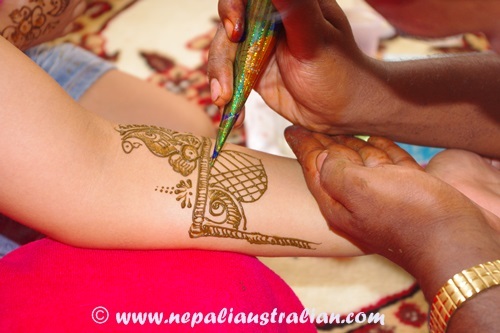 The bridal designs are so intricate, that they require several hours to be drawn and then to dry. My mehendi took more than 3 hours. It was hard spending 3 hours sitting on a chair, with somebody painting your hands and feet, you just cannot move even to eat, drink, go to the loo or basically do anything at all except for talking. I waited for another hour for the mehendi to get a little dry and then applied a mixture of lemon and sugar. It is supposed to make it darker. Whole day passed with us having fun while the mehendi guy was applying mehendi to everyone’s hand. The mehendi was followed, in the evening, by dancing and music. It was great to see people dancing including my aunts and cousins and having fun. My mum was also having a great time and even though she was busy at the same time as she was making lunch for the guests. It was worth all the effort and money I paid the guy at the end of the day.